Anyone whose mother likes wine need worry no more about how to celebrate Mother’s Day. Treat mom to a day of wine tasting on the Olympic Peninsula. Nice weather? Treat mom to a picnic on the beach. Eight Washington State Wineries and Cideries call the Olympic Peninsula home. Some of the wines they produce are made from grapes and other fruits grown right here, on the peninsula. Come learn all about what they do during a Mother’s Day outing. Have fun finding your favorite wines. Do you and Mom prefer sweet whites or robust reds? Perhaps you like dry whites or softer reds. Have you tried artisinal hard cider? Make a weekend of it so you can take your time and wine taste at your leisure. Stay in a hotel overlooking the Strait of Juan de Fuca in Port Townsend, a vacation rental in Sequim, or a historic Bed and Breakfast in Port Townsend. Discover the many fine restaurants that call the Olympic Peninsula home: the Alderwood Bistro in Sequim; Fins Coastal Cuisine in Port Townsend; the Ajax Cafe in Port Hadlock. Get picnic fixings at the Port Townsend Farmer’s Market, or the Chimacum Corner Store. 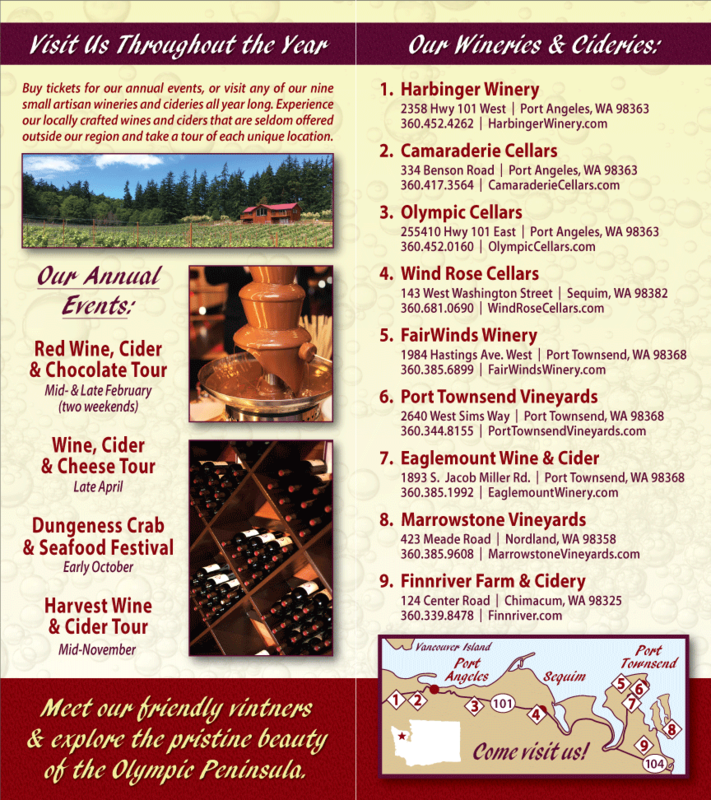 You’ll find many varietals at our member Olympic Peninsula Wineries. Help your mom find her favorite during a Mother’s Day weekend wine tasting extravaganza!